The Zodiac Trio enjoys an international concert schedule that spans three continents and presents an eclectic repertoire that mixes contemporary with the traditional. Protégé of the renowned Ysaye Quartet at the Paris Conservatory, the Zodiac Trio has performed at such leading venues as the famed Festival Radio France Montpellier, the International Colmar Festival, the Oriental Performing Arts Center in Shanghai, Izumi Hall in Japan, Lincoln Center’s Walter Bruno Auditorium and Tishman Auditorium in New York; has been broadcast by France 3 Televsion, Beijing’s CCTV News, Canada’s CBC Radio and Television, New York’s WXQR and WNYC, featured live on WGBH’s “Live from Frasier” in Boston and has recorded multiple times for Radio France in Paris. The Zodiac Trio was originally formed in 2006 at the Manhattan School of Music under the guidance of David Krakauer and Isodore Cohen of the Beaux Arts Trio. Shortly after its inception at the Manhattan School of Music, the Zodiac Trio debuted with a concert at the Kaufman Center prompting Edith Eisler of the New York Concert Review to describe the young ensemble as “…excellent, talented and committed…”. The debut was followed by a tour of Southern France where the trio was further praised by the local media: “…unforgettable concerts by the Zodiac Trio! ...Truly exceptional and sublime talent... The prestigious level of the performances radiated the undeniable talent of the trio and foreshadowed their great success in the future.” – raved the Nice-Matin. In 2007, the Zodiac Trio was first brought to the attention of the international chamber music scene in a feature by the London-based international MUSO magazine for “bringing a rare combination of instruments into the spotlight by unearthing old repertoire and commissioning new music.” At his time, the young ensemble was making its mark on the competition circuit having garnered prizes at the Yellow Springs Chamber Music Competition (U.S.), FNAPEC Ensemble Competition (Paris), International Chamber Music Competition of Duchi D'Aqcuaviva (Italy), Val Tidone International Music Competition (Italy), the Cziffra Foundation (France), Joyce Dutka Foundation for the Arts (New York), International Peninsula Young Artist Festival in California and the ProMusica Ensemble Competition (France), among others. The ensemble also received a Recording Grant and a Commission Grant from Co-Op press (resulting in its first commercial CD), are laureates of the 6th International Osaka Chamber Music Competition in Japan, and were awarded the Encore Grant from the American Composers Forum in 2010 to support their collaboration with composer Andrew List. With its reputation growing, the young ensemble has since performed throughout Canada, United States, Japan, many parts of Europe and most of China’s main culture metropolises. The ensemble has been critically praised for its “impeccable technique” (Ouest-France), "remarkable musicality of rare intensity" (La Tribune, France) and “truly exceptional and sublime talent,” (Nice-Matin, France); and declared by La Marseillaise as “one the best chamber ensembles of its generation...". Its numerous appearances have included Festival Radio France Montpellier and International Colmar Festival in France, Russian River Music Festival and Old First Concerts in California, Lincoln Friends of Chamber Music in Nebraska, Preston Bradley Hall at the Chicago Cultural Center, St. Vincent College Concert Series in PA, Schneider Concert Series at the New School, Merkin Concert Hall and Bruno Walter Auditorium at Lincoln Center in New York, Berklee College of Music, Boston Conservatory and Boston University in Boston, Mount Allison University, Virtuosi Concert Series, Four Seasons Performing Arts Center and Kitchnener Waterloo Chamber Music Society in Canada, Izumi Hall in Japan, and International Composers Forum in Sweden, to name a few. In addition, the Zodiac Trio has performed two extensive tours of China appearing in ten different cities, while presenting performance and educational clinics on some of the country’s most prestigious stages such as the Oriental Performing Arts Center in Shanghai, National Performing Arts Center in Beijing, Guangzhou Concert Hall, Shenzhen Concert Hall, etc. Dedicated to education both on a conservatory level and in public schools, the Zodiac Trio is often called upon to present master classes, clinics and music presentations for young audiences. The ensemble has given master classes at the Boston University, Berklee College, Boston Conservatory and the China Conservatory of Beijing, and has developed an innovative program for children titled “Sound of the Imagination” which debuted at the Beijing Children’s Theatre and have subsequently been broadcast by CCTV News in Beijing to millions of viewers. A strong advocate of new music, the trio has commissioned new works in order to expand the clarinet-violin-piano trio repertoire, and strives to serve as a platform of exposure for up-and-coming composers. Their debut commercial recording included two works written for the ensemble. 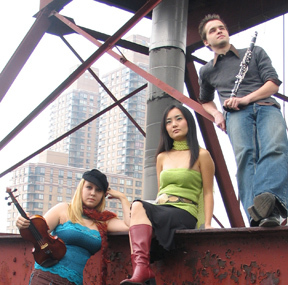 In 2010, the Zodiac Trio launched the Boston New Music Project in collaboration with Berklee College and Boston Conservatory, which serves as an outlet for contemporary music featuring American composers by presenting performances and student-composer readings/clinics, to encourage exposure and growth of new music in the United States. The Zodiac Trio is on the artist roster of the Cziffra Foundation in Paris, an organization dedicated to promoting Europe’s top young artists. In addition, the young ensemble was chosen by Culture France to receive moral and financial support from the « Declic » Program, partner with the Ministry for Foreign Affairs and the Mecenat Musical Societe General. The Zodiac Trio also enjoys the generous support of the Swiss Global Artistic Foundation. In the Spring of 2012, the Zodiac Trio will release a recording for the Blue Griffin label featuring Bela Bartok’s “Contrasts,” Igor Stravinsky’s “L’Histoire du Soldat,” Galina Ustolvskaya ‘s Trio for Clarinet, Violin and Piano, and the world-premiere recording of acclaimed French composer Nicolas Bacri’s “A Smiling Suite.” The Zodiac Trio profits from financial support of SPEDIDAM, which makes international touring possible. More information at www.ZodiacTrio.com.